Sierra Club Recognizes CSUMB as a "Cool School"
College campuses and their student populations are associated with youth, growth, parties, and out-of-the-box thinking. College students create and follow pop culture, influence political decisions, and champion social justice movements. Innovative thinkers like these also have their fingers on the pulse of the cutting edge of sustainability and conservation efforts. 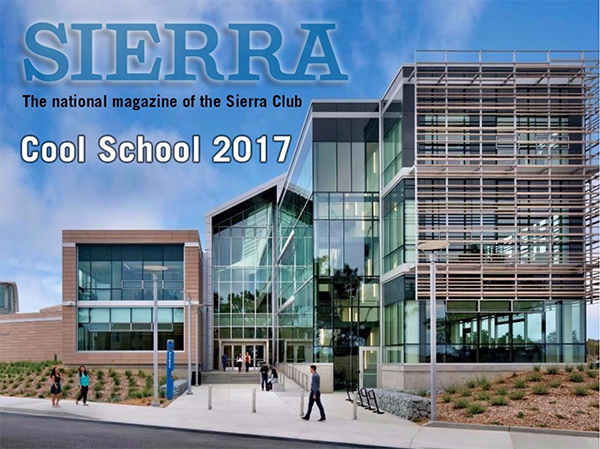 On August 22, 2017, the Sierra Club's magazine Sierra recognized Cal State Monterey Bay (CSUMB) as one of the nation's "Cool Schools." This year has been a tumultuous one for the US as Donald Trump pulled America out the Paris Climate Agreement, cut funding for scientific research on climate change, and vowed to revive the flagging and destructive coal industry. The schools on Sierra's list have committed to continue making strides toward sustainability and reduction of carbon emissions, and this year 239 colleges and universities submitted applications for the "Cool School" distinction. CSUMB was ranked number 152, and joined eight other CSU campuses in receiving the distinction. Lacey Raak is the Director of Sustainability at CSUMB. For the past two years she has been working to increase the impact of the school's sustainability efforts. She says CSUMB is doing everything it should to keep up with the Jones' of the sustainability revolution. She hopes to see the university take a higher place in the ranking in upcoming years. "I think there are strategic actions that can be taken regarding waste specifically," says Raak. "It's so much deeper than recycling." Lacey believes that a deeper understanding of sustainability by a broader group of people is necessary for lasting change to take place. Over the last few years CSUMB has taken great strides toward energy and water conservation. Sustainability measures have been integrated into the university's Masterplan, and future construction must meet standards set by the United States Green Building Council. Lacey also credits the implementation of more accessible public transportation as being instrumental in facilitating change. Students can take a shuttle to and from campus, and now Zip Car ride sharing is available for students to rent cars on an hourly basis, reducing the number of vehicles on the road and helping to decrease greenhouse gas emissions. Part of the CSUMB vision statement includes a commitment to serving the local community. Lacey says the newer sustainability efforts tie into this vision too. "We work really closely with FORA and we support FORTAG. There are lots of little community connections through service learners. We've had students work at Both Co. Aquaponics, and we want to increase the real food we offer on campus." Other steps Lacey hopes to see CSUMB take include implementing composting campus wide, and developing a materials management and conservation plan. She says she sees the university protecting the wilderness and connecting students to nature through the exposure they receive to Fort Ord, and the utilization of green spaces in the East Campus living community. "In terms of cool and unique things," Lacey says, "in January I'm doing a biophilic design charrette and that will be a one-day workshop for key campus stakeholders. The purpose is to explore ways to integrate biophilic design into our shared environment." Biophilia is the notion that human beings tend to seek out connections with nature and other forms of life, so biophilic design involves weaving elements of nature into shared environments. "People are drawn to nature," and so developing ways to make connections between the built environment and the natural environment helps create a more productive and positive space for people to live and work. She wants to see CSUMB taking on the Living Community Challenge - an ambitious endeavor which provides a framework for planning, design, construction intended to foster a mutually beneficial relationship between people and the built environment. "It's a pie-in-the-sky goal, but we need to start thinking that way."